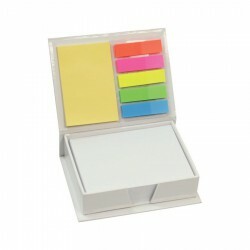 Promotional post it notes grabs your clients' attention and are a perfect corporate gifts. 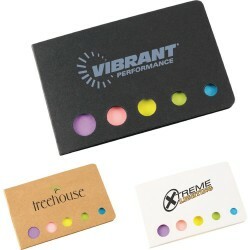 They are also popular as office products, serving as reminder tools for employees. 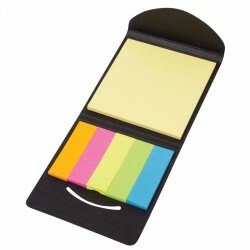 Promotional Product Experts range of branded post it notes offers plenty of choices including budget post it notes in a variety or designs which double as bookmarks and come with re-positional notepads. 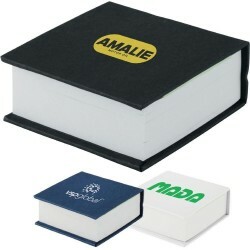 We also have memo pad sets, pocket sticky note sets and caddy holders. 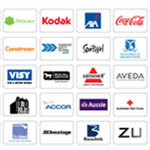 Products can be customised with your brand name or logo to maximise brand visibility. 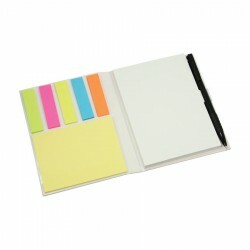 Hard cover notepad with sticky flags. 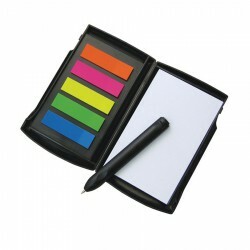 Includes 100 blank white notepad pages and 5 assorted-Colour sticky flags (25 pages per Colour). Recyclable. Non-refillable. 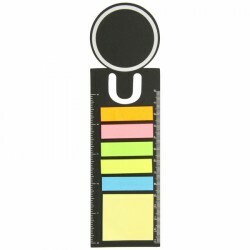 Circle shaped 14cm cardboard bookmark ruler with 1 block of sticky notes with 15 leaves(45mmL x 40mmH) and 5 adhesive note flags with 15 leaves per colour (Orange, Pink, Yellow, Green, Blue). Sticker notes. 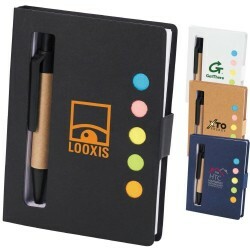 Set with 5 different coloured sticker notes, 1 medium yellow and 1 medium orange memo sticker and 1 large yellow memo sticker. 40 page A6 wire bound notebook with recycled paper pad, sticky notes and pen. 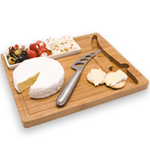 Ideal for conference packs and sales promotions. Five assorted Colour sticky flags. Includes a black ink mini-ballpoint pen. Includes 80 ruled page perforated notepad. Pen imprint not available. 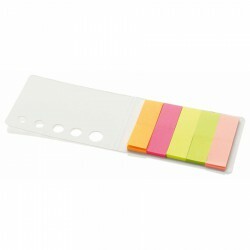 Includes 35mm x 46mm yellow sticky memo pad with 40 pages, sticky flags in 3 Colours and paper clips. 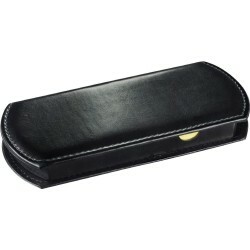 Case doubles as a ruler with both standard and metric measurements. 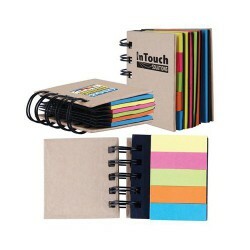 Includes four 50-page 38mm x 25mm sticky notepads, sticky note flags in 8 Colours and two-sided four-year removable calendar. Calendar size: 89mm H x 177mm W.
Set includes 2 sticky notepads with 120 pages, 120 sticky note flags in 5 Colours, ruler and ballpoint pen. Pen imprint not available. 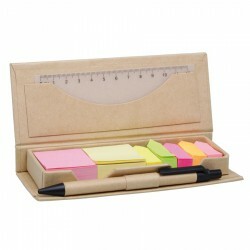 Hard cover memo case includes calculator, 8 assorted-Colour sticky arrows, 3 38mm x 51mm sticky notepads. Calculator features on/off power buttons. Includes solar power battery backup. 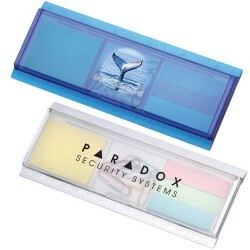 Folding booklet includes sticky flags in 5 bright Colours. Recyclable. Non-refillable. Checkbook-sized. 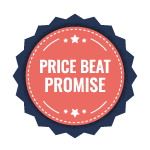 Includes two 38mm x 70mm sticky notepads with 25 pages, 25 sticky note flags in 5 Colours and 124mm x 70mm white notepad on inside cover with 25 pages. Non-Refillable. 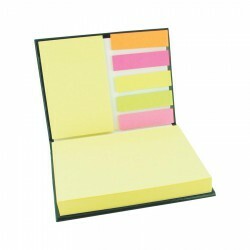 Tri-fold case includes a 25-page count of 76mm x 76mm yellow sticky memo pad and sticky flags in 5 bright Colours. Recyclable. Non-refillable. 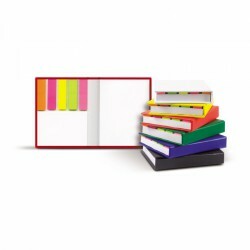 Hard cover jotter-style booklet includes 25 sheets of sticky flags in 5 Colours, 25-page 76mm x 51mm yellow sticky memo pad and 50-page 102mm x 76mm yellow sticky memo pad with elastic closure. Water drop shaped dye cut bookmark 13cm/5inch cardboard bookmark ruler with 1 block of repositional notepads with 15 leaves (45mmL x 40mmH) and 5 adhesive noteflags with 15 leaves per colour (Orange, Pink, Yellow, Green, Blue). Elephant shaped dye cut bookmark 13cm/5inch cardboard bookmark ruler with 1 block of repositional notepads with 15 leaves (45mmL x 40mmH) and 5 adhesive noteflags with 15 leaves per colour (Orange, Pink, Yellow, Green, Blue). 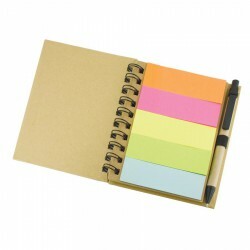 Spiral bound unbleached cardboard notebook with 5 blocks of (75mmL x 50mmH) repositional notepads and 1 block of 5 adhesive notes flags (Blue, Orange, Green, Pink, Yellow). 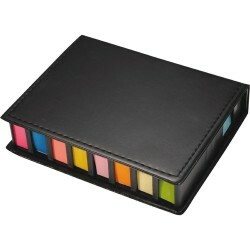 Adhesive note organiser with flip lid with 2 (57mmL x 45mmH) and 8 assorted colour repositional noteflags. 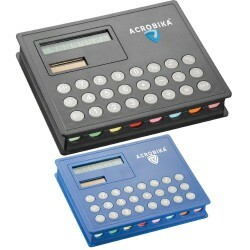 8 digit calculator on lid. 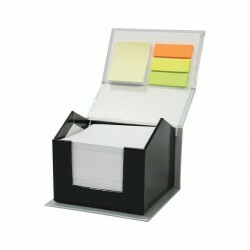 Adhesive note organiser with flip lid with 6 (75mmL x 25mmL) and 2 (75mmL x 75mmH) adhesive note pads. 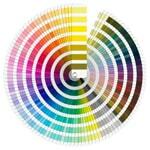 Reversible calendar insert can be replaced with your custom design insert (at extra cost). 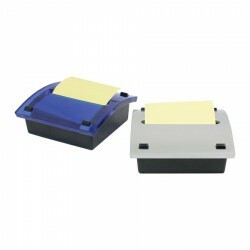 Adhesive note organiser with flip lid with 2 (75mmL x 47mmH) & 2 (40mmL x 48mmH) adhesive note pads & 8 assorted coloured noteflags. 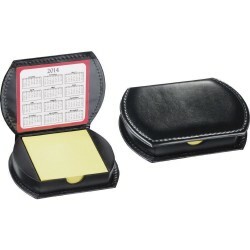 Reversible calendar insert can be replaced with your custom design insert (at extra cost). Letter slitter opens to reveal 5 coloured neon paper tape flags (50 in total). Ribbon shaped dye cut bookmark 13cm/5inch cardboard bookmark ruler with 1 block of repositional notepads with 15 leaves (45mmL x 40mmH) and 5 adhesive noteflags with 15 leaves per colour (Orange, Pink, Yellow, Green, Blue). Perfect for organising your desk and keeping everything in its place. 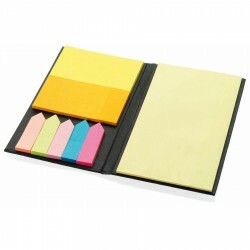 Features: Includes space for standard square sticky notes which are included. Perfect for organising your desk and keeping everything in its place. 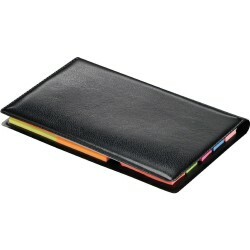 Features: Includes space for 2 sizes of sticky notes (included), paper clips (not included) and pens (not ncluded). Car shaped 13cm/5inch cardboard bookmark ruler with 1 block of repositional notepads with 15 leaves (45mmL x 40mmH) and 5 adhesive noteflags with 15 leaves per colour (Orange, Pink, Yellow, Green, Blue). Apple shaped dye cut bookmark 13cm/5inch cardboard bookmark ruler with 1 block of repositional notepads with 15 leaves (45mmL x 40mmH) and 5 adhesive noteflags with 15 leaves per colour (Orange, Pink, Yellow, Green, Blue). Bear shaped dye cut bookmark 13cm/5inch cardboard bookmark ruler with 1 block of repositional notepads with 15 leaves (45mmL x 40mmH) and 5 adhesive noteflags with 15 leaves per colour (Orange, Pink, Yellow, Green, Blue). 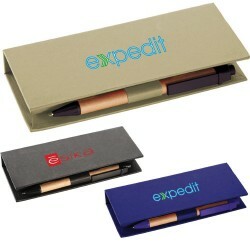 Memo set including white pad and coloured reusable flags in compact case with ballpoint pen. 1 notepad 75 leaves (62mmL x 50mmH) and 4 coloured adhesive paper noteflags (75 per colour) in Clear, pocket size notebook with pen. Business Card shaped dye cut bookmark 13cm/5inch cardboard bookmark ruler with 1 block of repositional notepads with 15 leaves (45mmL x 40mmH) and 5 adhesive noteflags with 15 leaves per colour (Orange, Pink, Yellow, Green, Blue). 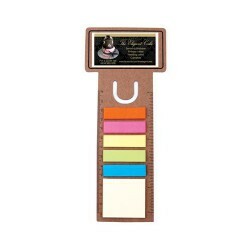 Light Bulb shaped dye cut bookmark 13cm/5inch cardboard bookmark ruler with 1 block of repositional notepads with 15 leaves (45mmL x 40mmH) and 5 adhesive noteflags with 15 leaves per colour (Orange, Pink, Yellow, Green, Blue). Love heart shaped dye cut bookmark 13cm/5inch cardboard bookmark ruler with 1 block of repositional notepads with 15 leaves (45mmL x 40mmH) and 5 adhesive noteflags with 15 leaves per colour (Orange, Pink, Yellow, Green, Blue). 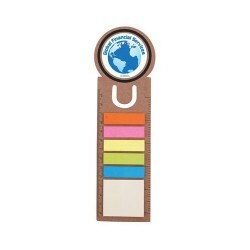 Circle shaped 13cm/5inch cardboard bookmark ruler with 1 block of repositional notepads with 15 leaves(45mmL x 40mmH) and 5 adhesive noteflags with 15 leaves per colour (Orange, Pink, Yellow, Green, Blue). Telephone shaped dye cut bookmark 13cm/5inch cardboard bookmark ruler with 1 block of repositional notepads with 15 leaves (45mmL x 40mmH) and 5 adhesive noteflags with 15 leaves per colour (Orange, Pink, Yellow, Green, Blue). Clover shaped dye cut bookmark 13cm/5inch cardboard bookmark ruler with 1 block of repositional notepads with 15 leaves (45mmL x 40mmH) and 5 adhesive noteflags with 15 leaves per colour (Orange, Pink, Yellow, Green, Blue). Don't loose any important memo again. 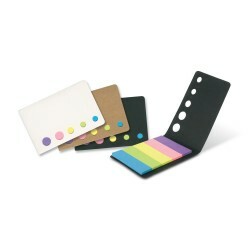 This small silicone memo holder with sticky pad will make sure that your messages will catch you eye!